This is the twentieth of twenty-five weekly articles in The Tennessee Star’s Constitution Series. Students in grades 8 through 12 can sign up here to participate in The Tennessee Star’s Constitution Bee, which will be held on September 23 from 9 a.m. to noon at Sycamore High School, 1021 Old Clarksville Pike, Pleasant View, Tennessee. Federalism and The Separation of Powers are the two foundational concepts framed in the United States Constitution which, together, were designed to protect the liberties and natural rights of individual citizens. Federalism refers to the division of powers between a national government and individual state governments, while The Separation of Powers refers to the three branches of government – legislative, judicial, and executive – whose competing powers provide checks and balances on the threat of tyranny. The legislative branch, is in itself divided into two separate legislative bodies, the House of Representatives and the Senate, each with its own unique powers. The Founding Fathers masterfully added yet another layer for safeguarding liberty through the method by which the members of the two legislative bodies would be elected. At the Constitutional Convention in 1787, the Framers decided that the members of the House of Representatives would be elected directly by the people (Direct Election) and the other, the Senate, should rely on each individual state legislature to select the two Senators who would represent its state in the U. S. Senate (Indirect Election). These two methods, “direct” election of House members and “indirect” election of Senate members, would allow the people two different types of democratic representation in Congress; the House of Representatives would have individual representation for the people as citizens of the nation and the Senate would provide collective representation for the people as citizens of their states. The two methods of electing members of the legislative branch, or Congress, is also reminiscent of each house’s unique representation. The number of House members from each state is determined according to the population of the state, thereby allowing larger states more votes. In the Senate, each state has equal representation giving all states an equal number of votes regardless of size. In other words, the people would be represented in the House and the states would be represented in the Senate providing for a perfectly federal system. Indirect election of Senators would also make it harder for legislation to pass considering that the duly elected Senators would be more conscious of representing the interests of their respective states. Senators would face tough scrutiny by state legislators if they failed to do what was in the best interest of their state and may not be re-selected to serve. It was decided, nine states in favor and two states opposed, to adopt two methods of electing representatives to the legislative branch, making the states an integral part of the federal government and giving them a strong voice in the formation of federal policy. James Madison stated that “No law or resolution can now be passed without the concurrence, first, of a majority of the people, and then of a majority of the states.” Madison went on to explain the difference between “national” and “federal” by saying that the House of Representatives was always regarded as a “national” institution because its members were directly elected by the people, but “the Senate would derive its powers from the states making the government ‘federal,’ not national.” In other words, the government in Washington is a “federal” government only if it incorporates the states into its very structure. Republican Federalism would stay intact for the next one hundred and twenty-six years. 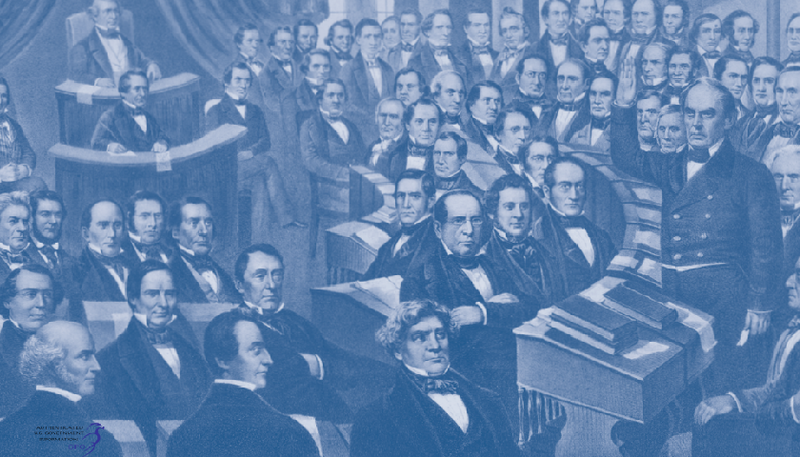 To understand why and how the change to direct election of Senators came about, we must understand changes that took place in the United States during the nineteenth and early twentieth centuries. In the early years of the republic, citizens focused on local ethnic, religious, and cultural ties upon which they based their political opinions. But, by the mid nineteenth century, the people started to identify with political parties, which had become better organized, well-defined, significantly ideological, and more national in scope. As voters began to choose between political parties, it was easier for them to vote for candidates in local, state or national elections who aligned themselves under the banner of that same party because, for the most part, voters had little information on individual candidates. The 1870s and 1880s reported the largest voter turnout in American history resulting from political party affiliation. As political parties became more powerful and more national in scope, voters, as well, began to concentrate their focus on national issues during election time rather than on local and state issues. Senators, who were chosen by state legislatures, likewise found themselves primarily dealing with national issues instead of their states’ concerns. The very purpose our founders had for indirect election of U. S. Senators was for them to be ambassadors from their respective states with the goal of protecting state sovereignty within and from the national government. All bills had to pass the tough scrutiny of the states before they could become laws. However, it seemed, with the onset of the political party system monopolizing the national scene, that state issues were being placed on the back burner. It was also beginning to be the case that state legislators were simply being selected according to whom they would support for U. S. Senate. State lawmakers also thought that if they could remove their responsibility of selecting Senators, they perhaps would be able to more intently concentrate their time on state issues. The timing of the national movement towards direct election is usually dated to the 1870s, when the first real efforts to amend the Constitution were introduced in Congress. Others point to the rise of the “public canvass,” in which Senatorial candidates, starting in the 1830s, would stump for state legislators, making state legislative elections into partial referenda on the candidates. The most famous example of the public canvass was the nationally-followed Illinois Senate race of 1858, in which the state legislative election served as a proxy for the titanic battle between Abraham Lincoln and Stephen Douglas, with Democrat state legislative candidates pledging their support to Douglas and Republicans to Lincoln prior to the election. The public canvass would soon transform into formal direct primary elections for Senators in many states. South Carolina was the first state to introduce the direct primary in 1888. After the Civil War, President Andrew Johnson said that he thought the arguments in favor of direct election of Senators were so overwhelming that they barely needed explaining. Regardless of when the beginning of the movement for direct elections is placed, it is clear that it picked up rapidly during the mid-1870s. Although not that commonplace, deadlocks, or the inability for a legislature to choose a Senator with a majority vote, was also an issue. There were 45 deadlocks in 20 states between 1890 and 1905 which left those states without representation until a Senator could be chosen. Delaware, for example, did not send a Senator to Washington for four years. Between 1890 and 1905, 31 of the 45 state legislatures had passed resolutions either calling for Congress to propose or pass an amendment providing for direct elections, to hold a conference with other states to work on such an amendment, or to have a Constitutional Convention such that direct elections could be included in a newly drawn Constitution. Why would the very institutions that stood to lose their power of selecting one house of Congress and their seat at the Federal table want this change? The most popular answer to this question is the fact that state issues were being ignored by legislators and by the very Senators they appointed to represent the states at the Federal level. The growth of the nationally-oriented political party system contributed to this problem. The national media were likewise weighing in on the issue. William Randolph Hearst hired muckraking journalist David Graham Phillips to write a sensationalist expose “The Treason of the Senate,” a series of articles in Cosmopolitan magazine attacking the appointed Senate as a club of corrupt millionaires. These articles were published in 1906. The relationship between national party platforms and the presumed need for direct election is perhaps made clearest in a remarkable editorial in the Chicago Tribune in 1894. It actually chastised candidates for State Senator for running on state issues! One of the most prominent researchers and writers on the history of the Seventeenth Amendment, Todd Zywicki, George Mason University Foundation professor at the Antonin Scalia School of Law, has advanced his own claims about the reasons for the passage of the Seventeenth Amendment. He argues that the Amendment passed due to lobbying by national special interest groups, ranging from business trusts to unions. David Schleicher, Professor of Law at Yale University, writes about Zywicki’s findings in his paper, The Seventeenth Amendment and Federalism in an Age of National Political Parties: “The groups supported the Amendment for several reasons, Zywicki claims, “It reduced the cost of lobbying for favorable legislation because lobbyists would only have to engage with one body and not fifty; it would increase the length of Senatorial tenures permitting long term relationships with Senators; it would reduce monitoring of Senators because state legislatures were better at making sure Senators did not do the bidding of special interests than the voting public.” National interest groups thus had an interest in direct elections because it made the Senate easier to lobby. The industrial revolution brought with it urban living and labor unions, and, as Todd Zywicki emphasized, the unions saw their chance to more easily influence elections, and legislation favorable to them, through direct election of Senators. Many scholars, like Schleicher and Zywicki, contend that the primary argument in favor of the Seventeenth Amendment in the late 1800s and early 1900s was that money and corruption in politics had become rampant and lobbying by big business was staining the republic. These were also the claims by those die-hard advocates of democracy, the Progressives. The Progressive Movement (1890-1920) promoted reforms in working conditions, urbanization, women’s suffrage, and others. On the false premise that rampant corruption would just magically disappear if the people voted directly for their Senators, Woodrow Wilson progressives marched forward on a path of destruction of republican federalism. The traditional story is that the rise of the Progressive Movement caused the passage of the Seventeenth Amendment. Progressives of the era pointed ravenously at these excuses for supporting the amendment: opposition to corrupt state legislatures bought by seedy business trusts and powerful party machines, dislike for corrupt “elite” representation and extensive faith in the ability of the people to govern when impediments to their rule were removed. It took less than eleven months for three quarters of the states to ratify it, and the Seventeenth Amendment became law on May 31, 1913. The Senate of the United States shall be composed of two Senators from each State, elected by the people therof, for six years; and each Senator shall have one vote. The electors in each State shall have the qualifications requisite for electors of the most numerous branch of the State legislatures. For 104 years, since the ratification of the Seventeenth Amendment, the U. S. Senate has been directly elected by the people. Did the change from indirect election to direct election remedy the problems described by the crusaders who championed direct election? Money and corruption in elections: For the first 70 years of the republic when the states had a powerful check on the federal government through indirect election, the Senate investigated one case of bribery. For the remaining 35 years of indirect election, there were only nine more cases investigated. The use of large sums of money to bribe state legislators was typical in indirect Senate elections because state legislatures could elect U. S. senators in advance of the start of the next Senate term, Senate elections occurred in every year of this time period. The bribery and use of money in campaigns seems to have persisted and escalated after 1913. Wendy J. Schiller, professor of Political Science at Brown University, and Charles Stewart III, Political Science professor at MIT, published a study, in 2013, the anniversary of the Seventeenth Amendment, determining how the Senate has changed since 1913 with the incarnation of direct election. They have made many conclusions on the effects of the Seventeenth Amendment. From 1871-1913, a total of $214.88 million per year was spent on Senate elections compared to the 2012 Senate election cycle in which $1,168 billion was reported, by the Campaign Finance Institute, to have been spent. Schiller and Stewart say the modern Senate elections far outpace elections under the indirect elections system. By any measure, the 17th was a poor way to solve the problem of corruption and the colossal amounts of money used for campaigns and influence. If anything, it merely pushed the corruption underground and spread it around. What was once a limited, illegal transaction between one candidate and the known state legislators is now a problem between one candidate and several thousand unknown and unknowable funding sources. It was easier to spot corruption when Senators were chosen and held accountable by state legislators. “A republic will never be greater than its people. If the electorate is corrupt, or too apathetic to guard against corruption, then their government will be corrupt,” as Virginia McInerney wrote in her paper Repeal the Seventeenth Amendment: A Step toward the Restoration of Federalism. State responsibilities: Those in state government claim a responsibility to address questions in the areas of taxation, education, employment, disaster relief, public safety, transportation, health care, marriage, and property rights, to name but a few. Yet all of those issues, and far more, are now primarily mandated, regulated, or directed out of Washington, DC, far away from the people being impacted by those policies. While the state governments bear much of the responsibility for their citizens, they have only secondary authority to do anything about the issues they face. Also, if federal courts decline to interpret the 10th Amendment as protecting the sovereignty of states, without a voice in the U.S. Senate, the states have no recourse. Unfunded Mandates: Statutes or regulations requiring a state or local government to perform certain actions, with no money provided for fulfilling the requirements, are called unfunded mandates. Since direct election of Senators began in 1913, states have been inundated with such dictates. The National Conference of State Legislatures says that there were six unfunded mandates prior to 1955, but between then and 1995, 186 Public Laws imposed a total of 241 statutory mandates or preemptions on states and localities. Forty‑five percent of these mandates were enacted just between 1985 and 1995. Between 1995 and 2009, the NCSL pointed to at least 11 other laws that CBO identified as exceeding the threshold of $50 million set in the Unfunded Mandate Reform Act of 1995. Since 2006, 167 laws have imposed mandates on states and localities. Under Presidents Clinton and Bush, there were 88 unfunded mandates between 1996 and 2008. Under President Obama, there were 101 mandates from 2009 to 2016. Examples of such power assumed by the national government that was intended to belong to the states can be seen in education and health care. “No Child Left Behind,” “Common Core State Standards,” and “Race To The Top” federal grants were all programs mandated for the states to implement. The “Affordable Care Act” has also proven to be an insurmountable burden for the states. The national debt grew from a little under $3 billion to over $305 billion from 1913 to 1963. It climbed to a staggering $16.7 trillion (or more) from 1963 to 2013. Perhaps if the states had a seat at the National table, as they did when state legislatures selected U. S. Senators, we would have had a chance to bring some of the spending to a screeching halt. With little representation in Congress resulting from the Seventeenth Amendment, the states have been reduced to mere administrative arms of the national government and the people are left with the bill. Special Interest groups and Lobbyists: Another major excuse that advocates gave for installing direct election of Senators was the involvement of special interest groups and lobbyists in the legislative process. Was this alleviated by the Seventeenth Amendment? Well, these groups representing all factions of our diverse society currently envelope and monopolize Washington, D. C. These entities have replaced the states and the people as constituents of the U. S. Senate. Prior to the Seventeenth Amendment’s passage, lobbyists were busy spanning the United States attempting to influence each individual state legislature for its choice candidate. After 1913, interest groups have only had to position themselves in one location, Washington, D. C., in order to achieve their goal of persuading only 100 Senators. There is a small office building called The Hall of States, near the Senate side of Capitol Hill, which houses offices for private lobbyists representing the 50 states. They have less clout and much smaller digs than the large teams of lobbyists for major corporations. Terms of office: Were the number of terms a Senator serves reduced or did they remain the same with the passage of the Seventeenth Amendment? Wendy Schiller and Charles Stewart III concluded in their study that Senators serve many more terms than their indirectly-chosen predecessors. U. S. Senators and Representatives were less likely to have served more than 2 terms prior to 1900 as compared to the years after direct election was implemented. From 1871-1913, 61 percent of elections involved incumbents seeking reelection and 39 percent were open seat; 70 percent of incumbents were reelected. Under direct elections, in 2010, 84 percent of incumbents were reelected to the Senate. In 2012, 70 percent of elections involved incumbents and 30 percent were open seat; 91 percent of Senate incumbents were reelected. It seems the answer is that terms-of-office increased. Within the Seventeenth Amendment, there is no provision to remove a Senator before his term has expired nor is there a limit on the number of terms a Senator may serve. Accountability: As far as the responsiveness of Senators to their constituents, Schiller and Stewart compared senators representing ten states, Kentucky, Pennsylvania, Delaware, Washington, Nevada, North Carolina, Louisiana, Maryland, Wisconsin, and North Dakota, during both the indirect period and the direct period. Senators who served these states prior to 1913, on average, introduced 76 bills and sat on 6 committees. Senators from these states who served from 1993 onward, introduced an average of 35 bills and sat on 4 committees. Deadlocks: The addition of the Seventeenth Amendment seems to have solved one problem that was occurring during the indirect election era. There are no longer deadlocks in electing Senators.